Aligra Wine and Spirits is the story of two passionate visionaries from Vancouver taking a neglected, under valued liquor store space at West Edmonton Mall and turning it into a beautiful Wine & Spirits store — an attraction and destination at Canada's largest shopping mall since 2007. Offering a fine selection of international wines and spirits, Alison & Grant and their knowledgable staff provide personalized, helpful service in a warm, inviting atmosphere. Every wine in the store has been personally selected and tasted to ensure we offer great quality and value to our customers. 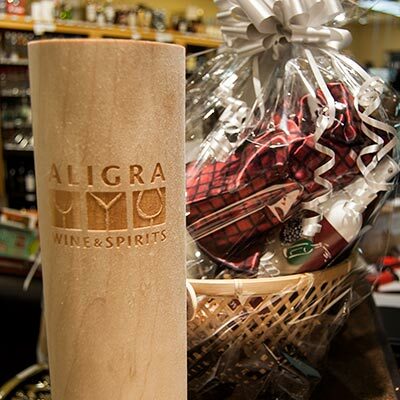 In addition, Aligra Wine & Spirits customize gift baskets, offer delivery within Alberta, and wine tastings and educational evenings at the store as well as international wine tours. We have a robust Wine Club & Tequila Club you can join. Information on upcoming events including Wine Maker Dinners, classes, special evenings, is available on the Events Page of this website. For up to the minute notice on events, pop up sales, specials etc. you can follow us on Twitter @Aligrawine or Facebook. We look forward to welcoming you into our store. Conveniently located at Entrance 58 Main Level of West Edmonton Mall between HMV & The Brick, just below Simon's. Reserved parking spaces for Aligra Customers located right outside Entrance 58. Planning a wedding, retirement party, or just a big shin dig? We do Beverage Planning , supply wine and spirits and licensing for every kind of event. Please, Contact us with your request. Looking for a special gift for a Corporate Client, or your best friend? Gift Baskets: We do custom, made-to-order gift baskets, based on your budget and product preferences: seasonal baskets and corporate gifts, retirements, weddings, anniversaries, birthdays, or just-because. Delivery service is available within the greater Edmonton area. 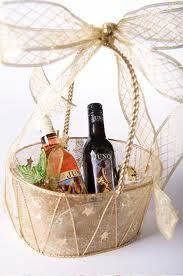 Visit the Gift Basket page on this website. Available Payment Methods: Visa, Mastercard, Debit, and Cash. Delivery: Delivery is available within the province of Alberta. Please contact us for options. Due to AGLC regulations, we are unable to ship outside Alberta. Identification: Aligra Wine and Spirits is committed to ensuring that liquor is not sold to minors. We require Government Issued Photographic Identification from everyone entering our store who appears to be under the age of 25. Please ensure that you are carrying the required identification prior to shopping. Children accompanied by legal guardians are welcome, of course.